Relaxed Performances are specially designed for people that have an Autism Spectrum Condition, anxiety disorder, learning disability or if you would benefit from a more informal environment. You can make noise during the show. If you sit in the Stalls, Dress Circle or Baylis Circle then you may come and go from the auditorium as you please, but this option will not be available in the Stage Stalls. The lights in the auditorium will be kept on so it doesn’t get too dark. We also make small changes to the lights and sound so that the show is more accessible if you have sensory sensitivities. There will be some lighting effects in this production but there is no repetitive flashing in the show. If you’d like a break from the show there will be several chill out areas in the foyer. Step-free access is available only in the Stalls area of the auditorium, and these seats also allow the option to come and go from the auditorium during the performance. If you would prefer to be seated in this area, please get in touch with our Box Office, who will be able to find the best seats for you that may not be currently visible or on-sale to the general public. If you sit in the Stalls, Dress Circle or Baylis Circle then you may come and go from the auditorium as you please, but this option will not be available in the Stage Stalls due to moving scenery. 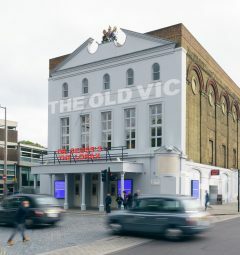 If you would like any further information on where the best place for you to sit would be please contact the Box Office on 0344 871 7628 or email access@oldvictheatre.org.uk. Due to limitations of our building (which are being improved in our upcoming building work) there are currently only two spaces available for wheelchair users in the Stalls. Please let us know at the time of booking if you need one. When you arrive at the theatre, please let us know you are here. 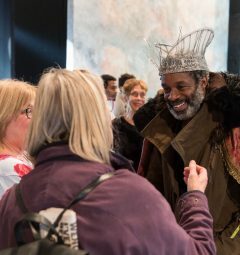 You will be escorted to the Webber Street side of the building where there is ramped access leading directly into the Stalls. We can take you into the auditorium up to 30 minutes before the start of the performance and we will accommodate any special requirements where we can. There is an accessible toilet close to this entrance. I have hearing sensitivities do you have ear defenders? We do not provide ear defenders but these performances can get noisy for the audience. If you have particular sensitivities to noise, you might want to bring your own ear defenders. You are also welcome to move around the auditorium to find a quieter area.